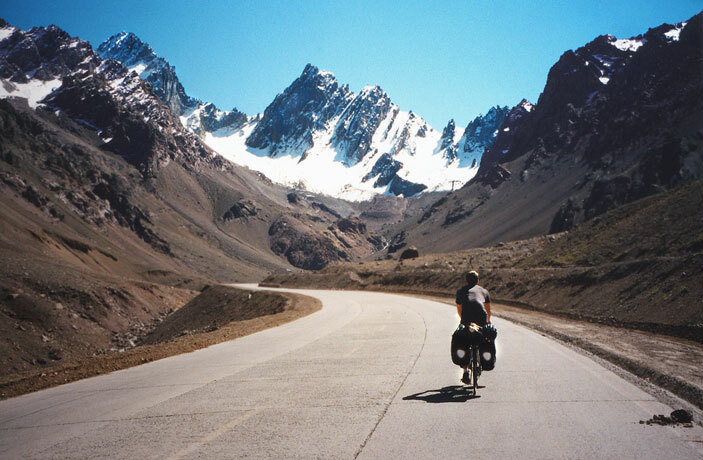 West to east, you could ride across Chile in a day. East to west, you could do it in an afternoon. 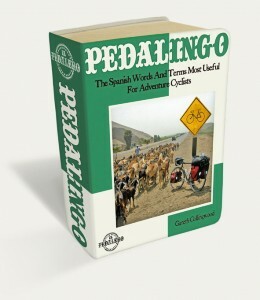 If you want to cycle Chile north to south, however, you’ll need about half a year. Everyone loves to describe Chile’s unusual outline; it’s a sliver, or a ribbon, or a string bean, or (most popular) a spine. But Chile’s shape isn’t the first thing you’ll notice. Although Chile’s population density is average for South America – about the same as Peru’s and much higher than Bolivia’s – most Chileans (about 90%) live in major cities, with almost half living in or around Santiago. But because of Chile’s shape the distances between these cities are immense. Don’t expect to find the roadside food stalls, random dwellings, or other signs of human life that you would elsewhere in Latin America. Touring in Chile is almost always spectacular. 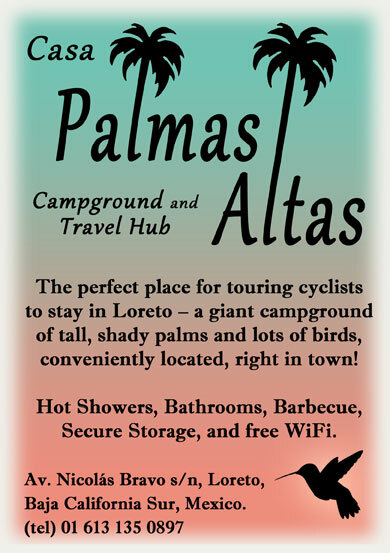 If you’re entering through Chile’s desert north, you’ll have to carry more food and water. You may see a town up ahead on your map, but that doesn’t mean you’ll find food or shelter – or even people – living there. Ghost towns are a feature of the north. Yet, for as unforgiving and oftentimes desolate as Chile’s geography is, if you persevere you’ll be rewarded with consistently spectacular scenery and spectacularly consistent people. From Arica to Punta Arenas, from the Atacama desert to the Carretera Austral, you can always count on Chileans’ sincerity and generosity. I lost track of how many times I was invited to dinner or given free accommodations. Chile’s main tourist sites are San Pedro de Atacama village in the north and Torres del Paine National Park in the south. 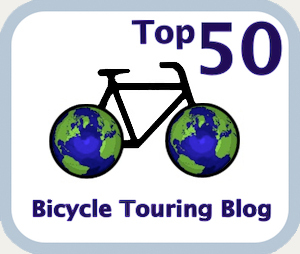 They’re both worth seeing, but as always, too much tourism diminishes the experience. Many of Chile’s lesser-known towns and parks are just as worthy of a visit but you won’t have to contend with touts, garbage, inflated prices, and backpacker scenesters. Chile’s lake district in austral summer. Some of my favourite Chilean towns: Valdivia, a pleasant university town surrounded by a confluence of rivers near a 17th century fort, Fuerte de Niebla. Villarrica, a relaxed lake district town near the impressive volcano of the same name. Valparaíso, a UNESCO-protected world heritage site with a labyrinth of hillside alleys reminiscent of Guanajuato, Mexico. Ancud, a chilled-out fishing village and my favourite town on Isla Chiloé. Coyhaique, a mid-sized town in the heart of Chilean Patagonia with an unusual, pentagonal plaza that had me constantly losing my bearings. Panguipulli, a very quiet, lake district town with unkempt roses sprouting everywhere. 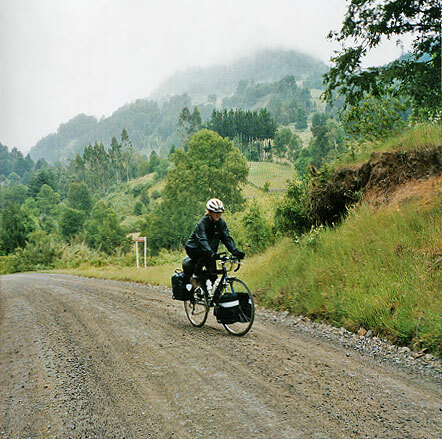 Some of my favourite routes: Villarrica-Panguipulli-Valdivia following the Río Calle Calle. Iquique-Antofagasta on Ruta 1, snaking between the desert and the Pacific. Los Andes-Caracoles-Mendoza up the switchbacks and through the tunnel. Ancud-Chonchi-Quellón on Isla Chiloé. Chaitén-Coyhaique-Puerto Ibañez along the Carretera Austral. Many people focus their tours in the south in the lake district and down the Carretera Austral, but I find something appealing about the bright air and stark beauty of Chile’s north, inhospitable though much of it is. 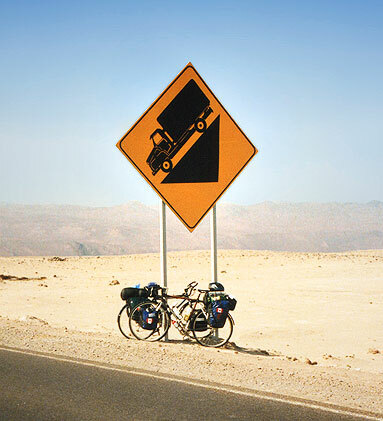 Most cyclists don’t ride all of Chile. Instead, they duck in and out from neighbouring countries fitting in sections of the country as suits their route. It makes sense, considering Chile’s strange shape, and I’ve found myself making the same decisions. But it also makes me feel I’m missing out on the real Chilean experience. Perhaps this is why I always talk about returning to Chile; it’s a county that still holds a lot of mystery for me. How not to hold your sword. 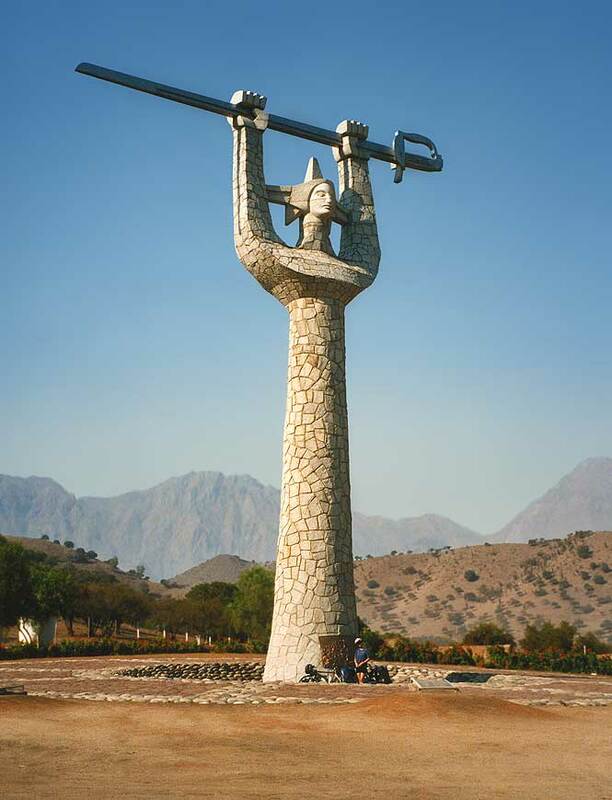 “Monumento a la Victoria de Chacabuco,” north of Santiago. Exiled poet, Pablo Neruda, once wrote, “my bones live in Chile,” and I think I know what he meant. Chile doesn’t jump out at you with colour and culture the moment you arrive, in the way Bolivia or Guatemala do. Instead, the “spine” reveals itself slowly, vertebra by vertebra, the longer you tour. And, yes, it gets into your bones. 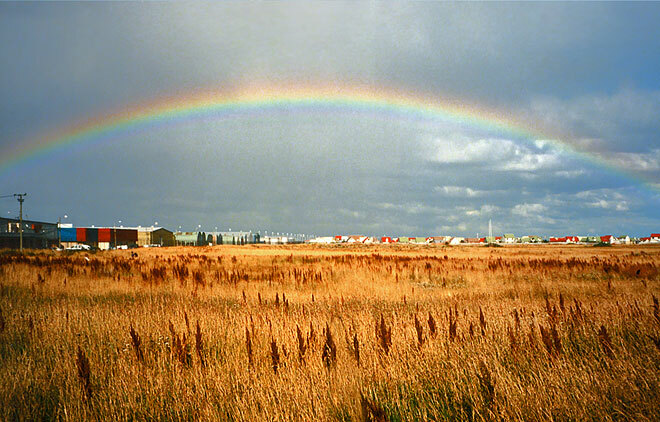 Zona franca near Punta Arenas. 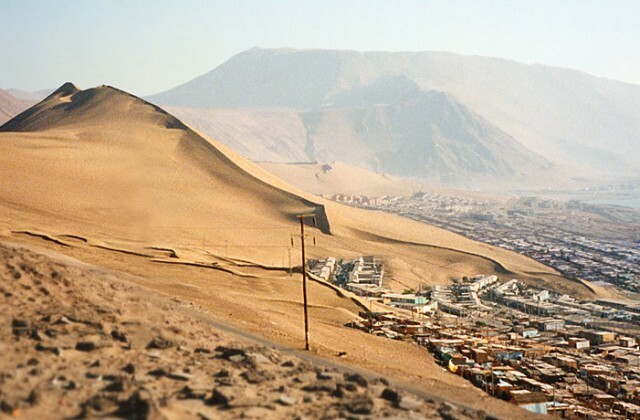 Feature image (top of page): The amazing Cerro Dragón (Dragon Hill) sand dune, towering above Iquique.